Competition from broadband newcomer Foxtel has prompted Optus to discount its unlimited Internet bundles. Optus is bundling unlimited broadband with a home phone or a Fetch TV package for $95 a month. The latter bundle offers access to Netflix, which can be enjoyed without worrying about surplus data costs. The $115 unlimited home bundle will combine both home phone and Fetch TV, while a $70 home basic bundle is available with Internet capped at 200GB and a metered home phone allowance. 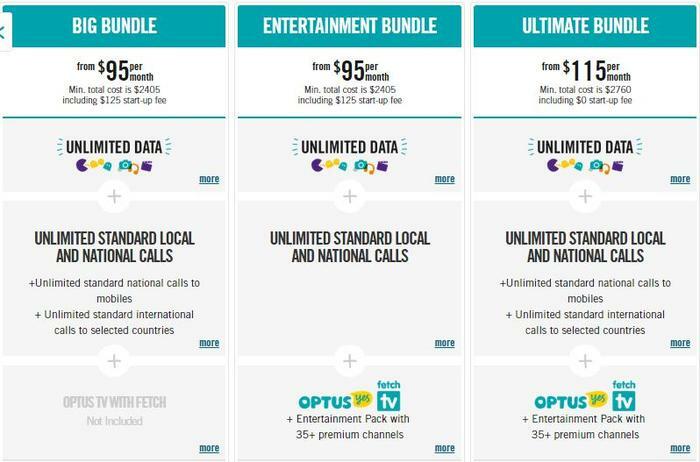 All of Optus’ bundled plans are contracted over two years and all plans — sans for the top-tier unlimited home bundle offering — incur a $125 'start-up fee'. Optus’ $95 hero plan represents a price drop of $20 per month. The discount follows a promotion that ran earlier this year, immediately after Foxtel entered the home broadband market. Bundled broadband packages are growing in appeal as more devices rely on a home Internet networks. Household data usage in Australia has jumped 35 percent in the year ending December of 2014, according to figures from the Australian Bureau of Statistics.